It is always nice to have a Santa Claus parade. It not only increases the competitive spirit, but can also double as an entertainment program for the rest of the people. Now, Santa Claus parade is a common feature in Christmas parties held at cities, offices, homes and neighborhood. In office, the best-looking Santa Claus might win some rewards. Santa Claus parades are most common in US. The largest is Toronto Santa Claus Parade, which was started in 1905 by the Eaton’s department store. It now has over 24 floats, 1.700 participants and 24 bands. It is broadcast around the world from Australia to Norway. In New York City, Macy’s Thanksgiving Day Parade, famous for its giant helium-filled balloons, began in the 1920s. The big balloons made an early appearance, with Felix the Cat in 1927. In Vancouver, the Roger’s Santa Claus Parade has also grown to be one of the largest, with 65 floats and bands. A special train also comes around in the parade, collecting donations. Peoria, Illinois has the longest running Santa Claus Parade in the U.S. Various attractions in the parade through the years include circus wagons, fireworks, live reindeers, a calliope and numerous parade floats. The Hollywood Christmas Parade in Southern California is a seasonal tradition that somewhat competes with the Rose Parade and the Doo Dah Parade. Large picture: Santa Claus Parade. Some may say that is absurd that Santas are making a parade between flowers and trees in the middle of the summer. 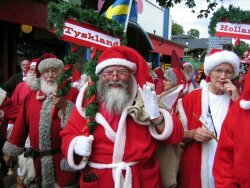 But the Santa Claus Congress and a Santa Claus Parade takes place each year in the old amusement park Bakken in Copenhagen, Denmark, in july. The Santa Claus parade held in a neighborhood or community is also attractive. Santa Claus is a popular character among students, especially when Christmas is celebrated in the schools and colleges. Students double as Santa Claus and wear the best of the suit to impress their friends and teachers. Often teachers instruct students clad in Santa Claus suit to present gifts to the students on Christmas or its eve as a friendly gesture from the school. Since Christmas vacation is long, schools organize Christmas celebration before the vacation commences. There will be religious programs signifying the importance of Christmas. It will be followed with entertainment programs. Finally, when everything comes to an end, suddenly the Santa Claus appears conveying the wishes to the students. He hands over the gifts to the students. Sometimes, the entry of Santa Claus takes a different turns. The school would have organized a competition for students to appear in Santa Claus suit. All the participants will be taken out in a Santa Claus parade. The best-looking Santa Claus will be rewarded. While organizing Christmas parties in your house, do not forget to organize a Santa Claus parade. It will be highly appreciated by friends and relatives attending the party. It will add entertainment value to the party. Also, it will help the kids in realizing the importance of Santa Claus and his significance to Christmas celebrations. It will be all the more better if artificial sledges, snowfall indicating the arrival of winter, accompany the Santa Claus parade and reindeer herd. Reward the Santa Claus parade participants handsomely so that they take part in the parades in future also.